Apollo 11 50th Anniversary Commemorative Coins are moving quickly. Their first-day sales combined to 296,311 coins, according to United States Mint spokesman Michael White. Add in another 49,825 coins for the companion Kennedy Enhanced Reverse Proof Half Dollar. Nearly half of the allotted gold coins are already gone and just over half of the five-ounce silver coins have been claimed. Altogether so far, the collection of coins has realized over $31.8 million. Released Thursday, product options include proof and uncirculated editions of $5 gold coins, silver dollars, and clad half-dollars as well as a proof 5-ounce $1 silver coin. There’s also a limited-edition set containing a proof Apollo 11 half-dollar and the previously mentioned enhanced reverse proof Kennedy 50c. All but the half-dollars had initial household order limits. Those limits were lifted today at noon EST, meaning collectors and dealers can now buy as many coins as they want until and unless their mintage limits are reached. *The half-dollar set has its own product limit of 100,000 with 49.8% of them sold in the first day. Buy Apollo 11 Commemorative Coins from the U.S. Mint’s commemorate online store. Orders are also accepted by telephone at 1-800-USA-MINT (872-6468). The gold and the 5 oz coin might sell out ,but I think the clads are dead weight . The Kennedy is at $139.00 by itself and a 2 coin set is $165.00 today. Many are more and few are going for less. I don’t understand the backorder for the 5 oz coin ’til May 1st if they are only half gone. Great question, Joe. I ordered five (5) at 12:04 and thought I had mine and discovered last night that my order is on Back Order. At least my Gold Proof was shipped. It is due to the amount of coins they strike prior to issue. They only mint a percentage of the total prior to issue. In this case it looks like 50%. When they reach that amount of coins sold they then have to mint additional to fill orders i.e. backorder. In the case of the 5 oz, they must not have struck anything close to 50%. As I recall, they went to back order in about 20 minutes so it makes sense that many more (most) were sold after the first 20 minutes. Many including the mint (or they would not have put a 5 limit on them) thought it would be a “hot” item. Perhaps, just guessing, they had problems with the strikes. If they did not have that problem, waiting over 3 months does not set well! Hopefully we will know the “real” story. Does the 50% sales in the 5 oz include backorder sales or only orders ready to ship? You would think it includes the back orders so that they could cut off further sales and show “sold out” when the limit was reached. Has anyone received a “shipped” for this item? i have 4 orders that have been shipped. and 6 on backorder. I agree since the mint’s website was jammed up with orders. I immediately ordered the 5oz proof a few seconds after ordering opened at 9:00 am PST, yet the order crashed on confirmation! I had to start over. I finally got my order confirmation confirmed at 9:21 am, yet I was disappointed to see that my order was back ordered with estimated delivery in May. I was on the mint’s site at exactly 12:00 and my 5 OZer is back ordered. That makes no sense. I suspect, similar to the WWI commemoratives, all coins were “back ordered” as they are producing to order volume in a single run. I ordered at 12:06 and they even reversed the charges to my credit card for the pucks. I assume to bill later when ready. USM is NOT practicing FIFO when in it comes to the processing of orders.., there are others in your same situation. I ordered mine at 12:04 and it didn’t say BO. It was in my cart and confirmed during check out. Later on when I got the ship info they weren’t there! I agree they are doing something wrong or shady because they couldn’t have sold 50,000 by the first 4 minutes when I ordered and was confirmed. I also ordered at 12:00 exactly….and my 5 oz Silver coins were also immediately BACK ORDERED til May !! They obviously didn’t have any 5 oz available…….strike / production problems !!!! And they say not available until May !!?? Because of the immense size and the concave / convex nature of the coin, the mint had to move to a 999 fine blank. I think they are moving slowly until they perfect their minting process with as few errors on their part as possible. Just my hypothesis however. Actually and under the law, 3″ diameter 5oz silver Apollo coins are specified to be .999 fine silver. I noted, prior to when the coins went on sale, that the USM listed them as 99.999 silver. Now the same page lists them as 99.9% silver. What is up with that? (C) contain .999 fine silver. People were saying that the $5 gold proof / uncirculated would be the first ones gone, And according to this writing, Not even half are gone yet between the two of them. Maybe now that the “one per household” limit is lifted… Time will tell. The total mintage for all categories are TOO HIGH !! Poor sales and all the ORDER LIMITS HAVE BEEN LIFTED !!! This happens alot after day one, Harry. It doesn’t mean poor sales at all. I got my shipping notice today and the 5 oz coin shipped. I went through the web site but didn’t get it submitted until about 10 minutes after noon. Just hit or miss on the ones that shipped. I ordered right at noon and got confirmation on the 5 oz coin and the silver dollars. Later I had a shipped notice and it said 5 oz were on backorder. I called to ask and the US Mint said they fulfilled the orders of quantity of (5) 5 oz first leaving the ones that ordered fewer than 5 for last. If I had known that I would have ordered 5 instead of 3. Disappointing – guess I will be waiting like some of the others. Well that’s an interesting excuse… as I ordered only 2 of the 5oz coins and they have shipped. That was at approx 12:03 when the order went in. I don’t understand at all how they pick and choose orders, you would think it would be FIFO. It should be. I firmly believe the people at the Mint just BS away as I have been on the receiving end of a line of bull from them with past purchases. Sorry to hear your troubles. I understand. I agree with the BS – normally I get no more information when I call than I already knew myself. Orders should be FIFO. Well at least I will get them – hopefully. Would love to know what % of the 51,000 1st day orders have shipped, or will be shipping this week. A lot has certainly changed within the collector base for Moderns over the past 5 years.., I would categorically label 1st day sales as dismal, shocking, and concerning. It’s been a helluva run over the past 10 years.., & fun. 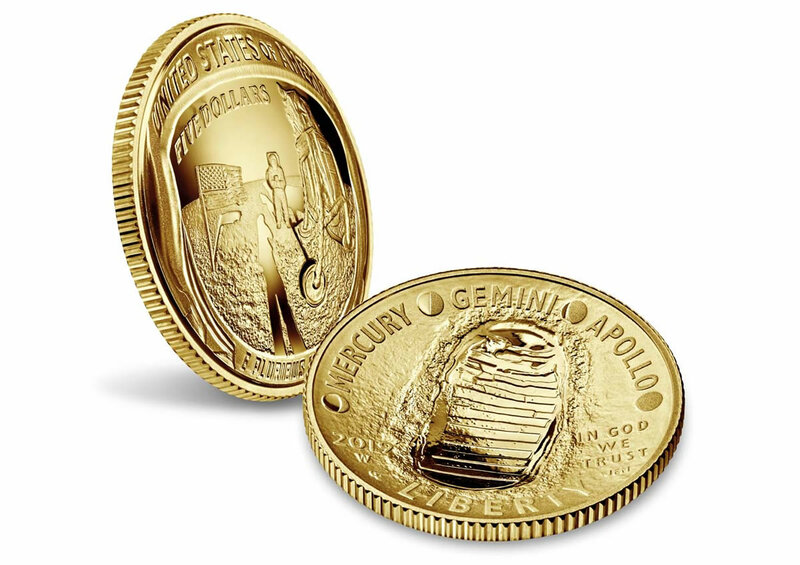 The problem with demand for these coins is that most people under the age of 50 are not very interested in the ancient 50 year old Apollo anniversary. I think there are supply side production problems at the Sunshine Mint, trying to produce so many perfect three inch .999 pure silver proof blanks, they are the lone supplier that’s another problem. The US Mint is admittedly have trouble pressing these large and curved proof coins. We might be shocked at how very few PF70’s the Mint is actually capable of producing due to the extreme difficulty they are having with such a large curved coin, maybe only 5% will turn up PF70. These may be one of a kind coins if the US mint decides to stop producing them now or in future years. Any thoughts? Wow, I see the PF70’s are pre-selling for $550 on eBay, that’s a 100% mark-up, and this price assumes all is normal and going well at the Mint. $550 for a PCGS PF70 Early Release might be a 50%- 75% discount to their true value and an absolute steal if things are going poorly at the Mint. In three weeks or so we may see the price move up to $2000 for a PF70, It might be worth purchasing one or more for only $550 each! I also ordered yesterday on line, confirmed 5 oz Silver Proof and Proof $5 Gold Coin shipped with tracking number assigned from the Mint. I think your right some of us just got luckier than others.Checked a few minutes ago, all are still available except the 5 oz Proof, back ordered. “Harrigal said that, when it was determined that the production dies would be each individually machined, the process was reduced from 14 hours per die to 11.5 hours. With a sellout being projected, it’s likely 1,000 pairs of dies will have to be prepared.” – this equates to 100 coins per die, and each die is labor intensive to manufacture. Mint probably, due to required labor intensive die process.., simply ran out of time to strike (or prepare all the needed dies) coins, and hence, we have a Back Order situation. You are welcome. This article did have some nice nuggets of information. Hoping this equates to quality throughout the full minting process. Thank you, Rooster and KC&SO for the link to the article. Was a little concern when saw Barb comment about the distribution but some what less when J Peter commented. However, with the apparent “hit or miss” on filling orders one has to wonder, since the limits were lifted, if they will now fill the “big”orders for the apparent favorites first. Usually, they will provide a back order date on ones order, but I have not gotten one. The only thing provided is the May 1, 2019 date when you click on the product and add to the cart. Will be of interest to see who has these for sale in the coming weeks. After reading the article again, what will be the impact on having orders filled even by 5/1/2019 since there is only one press and it is used for the 5 oz ATB program too. The next release of the 5 oz ATB (“Lowell”) is 2/7/2019. First Strike or Early Release designation for graded coins. The quality should be consistent with the number of dies they prepared. Of all the Commemorative coins ever sold, this is the singular most eventful Human endeavor of all time!! Forget the hype and the disillusioned!! And to think that the $5 Gold coins, proof or not, is a high mintage? Then you are ALL HIGH! This is not just an American thing!! 7.5 BILLION people on this planet! And 50,000 coins available!!?? Mr. Unser – I have couple post hung up in the ‘Moderation’ penalty box, is there something I need to do to avoid that? 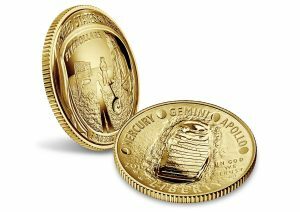 The Mint anticipated a sellout of the Apollo II coins. They should have either set the first day of sale much later in the year so that they could have all the coins minted and ready for immediate shipment, OR they should have posted prominently on their website BEFORE the January sales date that shipment may be delayed for several months. Holding off until later before offering them would probably still result in a sellout by the end of the year. If they forewarned customers to expect a delay in getting their coins, most of us would be understanding, but by waiting til a customer orders before telling them, it just aggravates people. It will be interesting to see as the months go by how many collectors get tired of waiting and cancel their orders. That will be the end of the hopes for a sellout!! I guess none of you caught HSN last night. Mike had the raw 5oz and graded 5oz. The dollars the gold the halves. He showed every version except the 2 coin set graded and raw. He even has an exclusive label and core with ngc for the 5oz. How is it he was able to get quantities of all to put on his coin show. $599.99 for the raw 5oz. charlie, thanks for your post. How is a good question… Do you recall the asking price for the raw gold coins? Ordered 1 of the 5oz and 1 each of the gold confirmation email 12:06 notice of shipment email late Friday night credit card charged date 1-25. Probably will be delivered Thursday. today i got my order, suppose to be 1 proof gold & 1 uncirculated gold. when i opened the box there were 2 uncirculated gold. they did not send me the proof. i called the mint and got the problem worked out. i have to send back one of the uncirculated and reorder one of the proof which wil not be in til may or later. I wonder how often that happens. I have had poor packaging and coins flopping around though. this is the first time it has happened to me. i think they were just extremely busy but that is not really an excuse. Hope it works out ok. They should not make you wait because of their error. Well I just got my shipment of gold today too and the Mint sent me 2 uncirculated also! I too was supposed to get 1 of each. Whats the deal here with the Mint? I have not called them yet. Lonnie did they offer to pay for return shipping for the coin? They tell you you will get your coin in May or later?? That’s a bunch of crap. Now that the household limit is off, has the Mint dedicated the proof gold to the big coin dealers first? I think once a long time ago I returned an order and was told the Mint would reimburse me for the shipping and they never did. What a rotten deal we have to now wait for our coin until May. Gents: For this to happen to two (so far) on this post I decided to open my gold proof box. It was indeed the proof and beautiful. This is a major shipping flaw for you two. The mint should move you to the head of the line and reserve one for you and the untold others that may have the same issue. It was a sad mistake…. The best they could do for me was to send me a UPS shipping label so I could return the coin. They would then exchange and ship me the correct coin, however, they of course didn’t say anything about getting the coin in May, I had to prod them for that information. If I was not satisfied, of course I could return it all to get my money back. On another note I did get the 5oz coins and they are SPECTACULAR!!!!! If anyone is on the fence about the 5oz-ers, go get 1. You will be pleased, but OUCH on the pocketbook. Check your packing slip that came with your coins. It should have all the necessary info and return label. I just ordered from the US Mint five more of these very impressive 5 oz. masterpieces before their imminent sell-out either today or later this week. Today is January 31st, the US Mint has just pushed the new 5 oz. coin back order date out seven months to the end of August, this is creating a feeding frenzy for all first strike coins. Wow, very limited in hand quantities along with ever increasing monthly demand as we approach July 20th, equals rising prices. This is a time to buy all you can from the US Mint, these coins will go higher. I purchased five more today before they are gone forever, and I’m still waiting for my five Kennedy sets to arrive, has anyone received theirs yet? I hear that these first ever minted (enhanced) reverse proofs are very sharp looking! The US five ounce coins have four firsts… first to be a 99.9% pure silver coin, first 5 oz. to be curved, first reeded 5 oz. coin and it’s the first five ounce proof. The coin has already made history in this regard and in its extremely slow production. If they are having so many problems wouldn’t it be easier to just stop minting them, this is very unusual. I think that maybe they have stopped minting them…. The new back order date is now October!!! Hi Brandini, I would send that coin back and quickly order another one right now before they sell out. I have received five of the fifteen that I ordered, three or four of which are perfect PF70’s and the last will grade PF69 because of one tiny pinprick dent near the top edge of the obverse field, just above the second “L” in the word DOLLAR. So the odds are very good that you will receive a perfect coin in exchange for that lemon, good luck. These are the most spectacular coins that I have had the pleasure of holding during my forty years of coin collecting! Gold prices adjusted up. Proof is $431. Uncirculated is $421. Delivery date March 11 th. Many returns for the Golden & Silver clad Cockroach coin!! Ugly! !